The Crested Butte/Telluride soccer rivalry intensified as the Titans edged out a 3-2 win at home on Saturday, September 6. Last year, the Titans soccer team handed the Telluride Miners two losses. 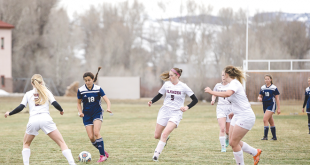 Even so, the Miners wound up with the league title, with Crested Butte in second place. Every time the two teams meet it’s a physical high-speed battle, and Saturday was another classic example of the competitive tradition. The Titans opened the game striking in the first 16 seconds as they linked three passes off the kick-off to find senior Robbie Holleran charging straight to net for the finish. Following the initial strike, the Titans settled back as the Miners came at them for the next eight minutes looking to equalize. The Titans soon found their possession game and held the ball in the Miners’ end for a majority of the first half. The efforts of senior John Wright created numerous scoring opportunities for his teammates, but they failed to find the back of the net. Ultimately, Wright took matters into his own hands—er, feet—and took a pass from senior Jack Linehan to score the Titans’ second goal of the game, just prior to the end of the first half. 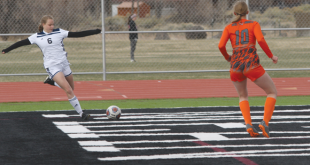 Crested Butte maintained its intensity for the opening 10 minutes of the second half, forcing the pace of the game and continuing their attack on the Miners’ net. Telluride held tough, with outstanding play from their keeper, but the Titans broke the seal one more time when Holleran struck again. A trip outside of the penalty area gave the Titans a direct kick opportunity and Holleran seized it with a quick strike, catching the Miners off-guard and giving the Titans a 3-0 lead. Yet an air of complacency soon crept into the minds and hearts of the Titans players as the Miners turned up their effort to pin the Titans back in their half for the next 20 minutes. The Miners took control of the game, out-hustling the Titans to every loose ball and constantly finding the open player as the Titans defense chased the ball frantically. Telluride clawed their way back into the game, hitting two from 25 yards out to cut the Titans’ lead down to one goal with 10 minutes left. The scare woke the Titans up as they were faced with blowing a three-goal lead to their rival team. The defense tightened up to shut off shots and clear the loose ball, creating a couple more scoring chances and taking the pressure off for brief stints. While Crested Butte struggled to find the insurance goal, the defense did its job and sophomore goalie Ben Frame came up with two of his 10 saves down the stretch to preserve the 3-2 win. Unfortunately for the Titans, their second-half woes followed them for their game against Ridgway on Tuesday, September 9. Despite being outplayed by Ridgway in the first half, the Titans’ efforts were rewarded with goals by Holleran and sophomore Sam Evans to build a 2-0 Titans lead. Ridgway surged in the final moments of the first half to score before the break and opened the second half energized by their first-half goal. Ridgway maintained pressure in the Crested Butte defensive half for almost the entire 40 minutes of the second half as the Titans struggled to link consecutive passes together to mount counter-attacks. The pressure paid off for Ridgway as a shot from 25 yards out skipped off the head of a Titans player and past the hands of Frame in-net to tie the game 2-2. Five minutes later, Ridgway converted on a penalty kick to take a 3-2 lead and held on for the win, handing the Titans its first league loss of the season. The Titans head to Salida on Friday, September 12 and then return home to host league opponent Center on Saturday, September 13 at 11 a.m.